Hello, we've got a gorgeous spring day here in SC, and I was able to get some nice natural sunlight to take a photo of my latest card. Recently a really lovely friend of mine, gifted me with Polychromo Pencils. I had been wanting to try these for a LONG time. And waiting for a sale on them over Christmas proved fruitless. In the meantime I'd purchased a set of "like polychromos" and they are actually really nice. But now I've used the best and these really are as amazing as they are advertised. That's not to say I won't use the others..but gotta say, these will be my go-tos! So thank you soooo much Cathy, you are amazing! 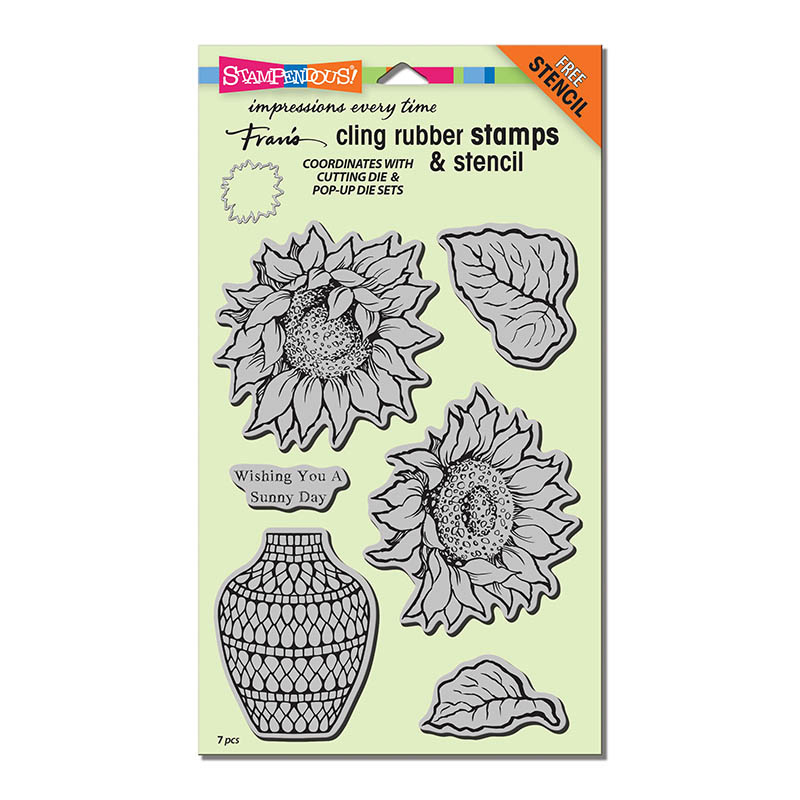 I was recently cropping with my friend Kayla and we were playing around with this set, Stampendous Sunny Vase. I love the pattern on the vase and of course cannot resist a beautiful sunflower. One of my favorite images to color! I used a variety of blues and greens to ink my background with distress inks and did a little watersplatter. After my images were pencil colored, I did a little white acrylic wash splatter on them, just to add a little interest. I cut the tiny tag out from this set by Newton's Nook Designs Tags Times Two on kraft cardstock. I had this little thank you sentiment in an older Stampendous stamp set, which is now obsolete. However you can use any tiny sentiment. I finished it off with a tiny twine bow and some Studio Katia Iridescent Clear Crystals. Thanks for stopping and have a wonderful day! I honestly couldn't remember what day it was..but we're at Thursday, WOW, more than half way through the work week already! Today is a beautiful sunny day here in South Carolina and I've already finished my morning routine. So I thought I would share a birthday card I made with you. 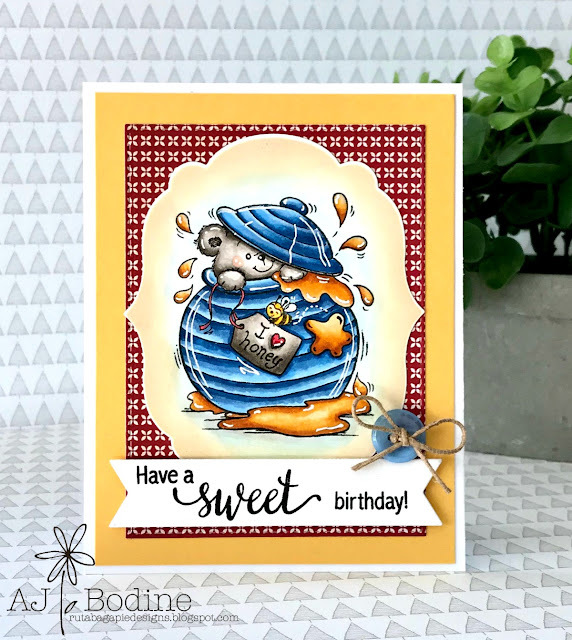 Recently I placed an order with Your Next Stamp and I received this super sweet little Honey Bear! There's something about coloring pots that I just love, and this one is extra sweet with all the honey splashing out! In addition to copic coloring the image, I distress inked around it using Scattered Straw. I mounted on some patterned paper from my stash and added a blue button with a waxed hemp bow tied through it. 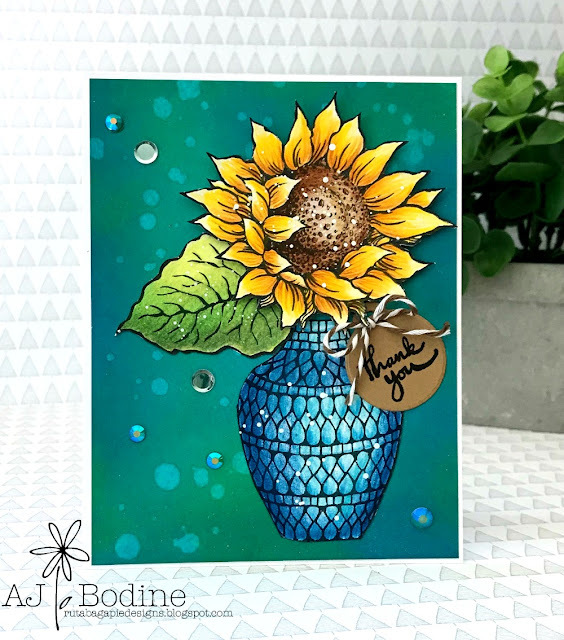 The base layer is Sunflower cardstock by Lawn Fawn. I created the banner using a die from the Frames and Flags Die Set by Newton's Nook Designs. 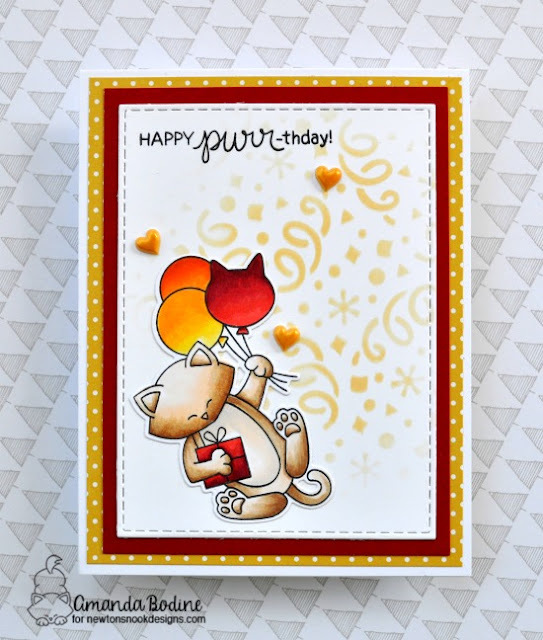 I hope you've enjoyed my card, have a wonderful day! Say it isn't so, today is our final reveal day of the March release at Newton's Nook Designs. But you know what that means! Everything will be available in store tomorrow!!! 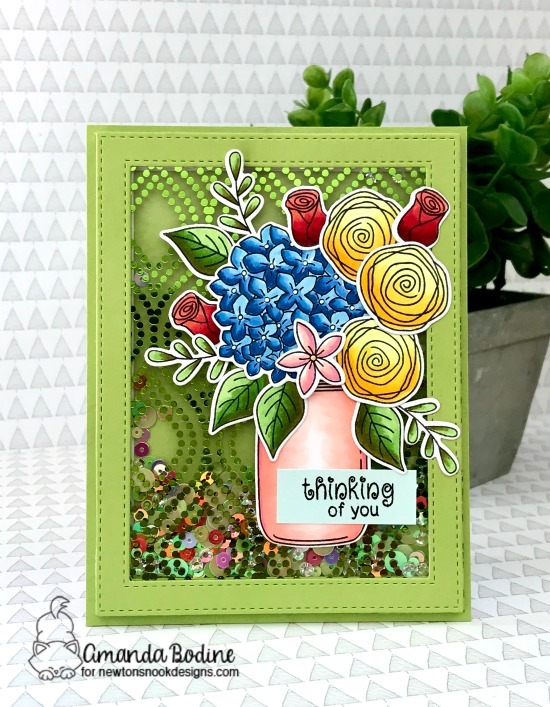 Today we have one last stamp set to show off and it falls right in line with the birthday theme we've been featuring all week. It's called Birthday Essentials and I love the variety of sentiments! 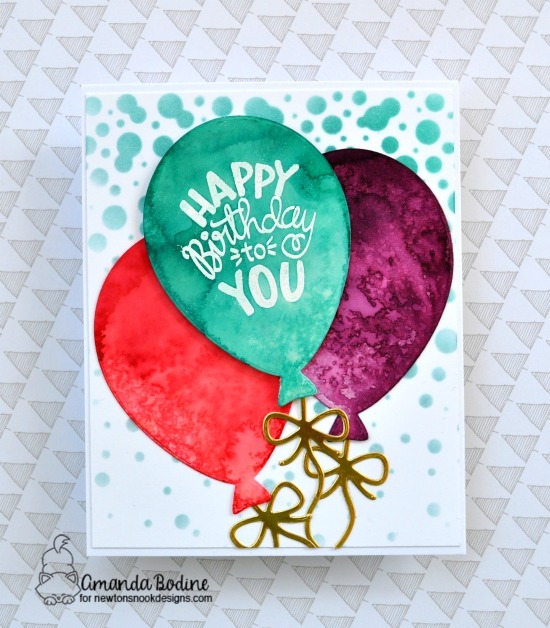 In my first card, I used the sentiment Celebrate on my background to match the balloons my girl is floating away with. By the way, this girl is an image in the Holding Happiness stamp set we featured day 1. I stamped a second sentiment and white heat embossed on a black banner. For my second card, I used the Make a Wish sentiment and created a shaker balloon that I popped up over a strip of bold striped paper. I cut the balloon and little shaker elements using dies that came in the Balloon Shaker set we featured on Day 2 This is a simple but fun card and I enjoy this shaker balloon set so much! 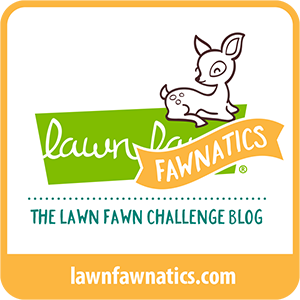 Thank you for visiting my blog this week and commenting so you are eligible to win! 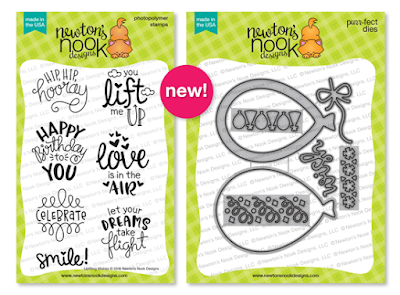 Hello and welcome to day 3 of the Newton's Nook Designs March release! Oh my goodness, I am in LOVE with this set. Newton's Birthday Balloons! It's a really fun image to color and I love the little puffy clouds. I promise you, this is a birthday set you'll reach for over and over again! I made 2 cards using this set today. The first, I inked up the background in a vibrant turquoise color, then I used the Bubbly Stencil with a tiny bit of light lime green and then over the top with some white pigment ink. I just think this background turned out fun! I copic colored Newton and popped him up with foam against the sky and added a few little clouds and hearts. 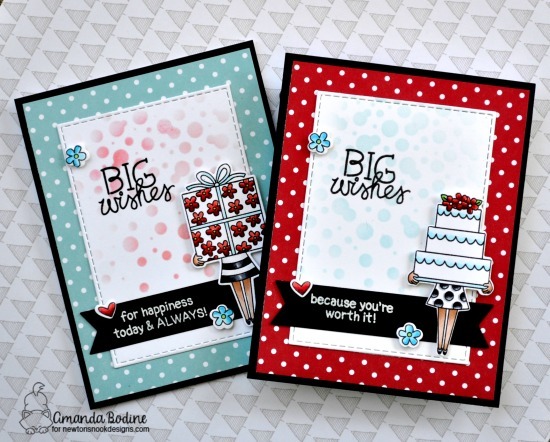 The sentiment is from Uplifting Wishes which was a set in yesterday's reveal! Here's my second card in a different color scheme. 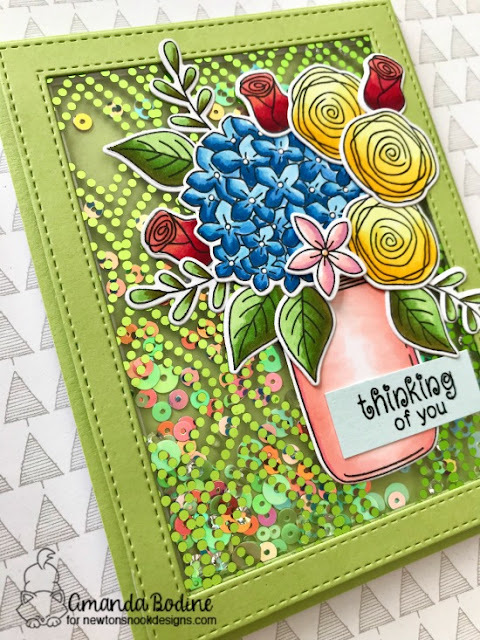 I used the Confetti Stencil on my background which I love the look of. It matches my polka dot paper, such a fun way to tie the project together! Hello again and welcome to day 2 of the March Release here at Newton's Nook Designs. 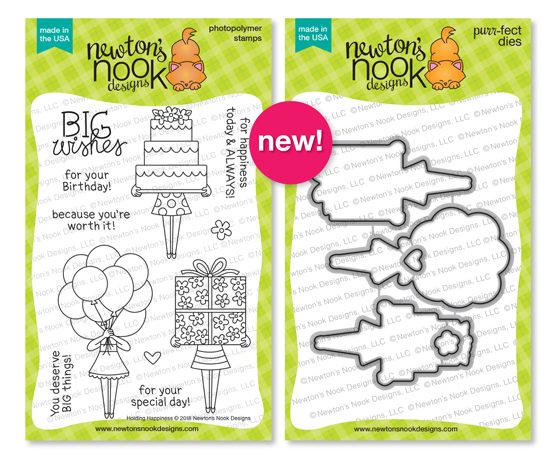 Today, continuing on with a fun birthday theme, we've got this SUPER FUN Balloon Shaker Die Set and a coordination stamp set called, Uplifting Wishes. 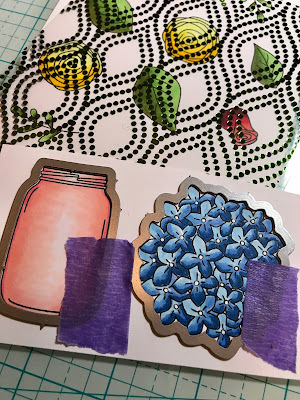 Today I used the portion of the balloon die set that you may cut your acetate layer with..or you can cut out to make balloons! I inked up my balloons cut out of watercolor cardstock, then I spritzed them to get the color to run a bit. I should mention that I heat embossed the sentiment in white on the middle balloon first. As it dries, the color runs off the sentiment, and it really stands out! I used the Bubbly Stencil on the background! So you might be thinking..what on earth is this? Well, I had also cut out some of the shaker balloons for a project I'll show later in the week. The inside of the balloon cut out for some reason just said flower petals to me. So I distress inked and water splattered the leaves and petals and assembled this bold flower on some large check patterned paper on a 5x5 background. 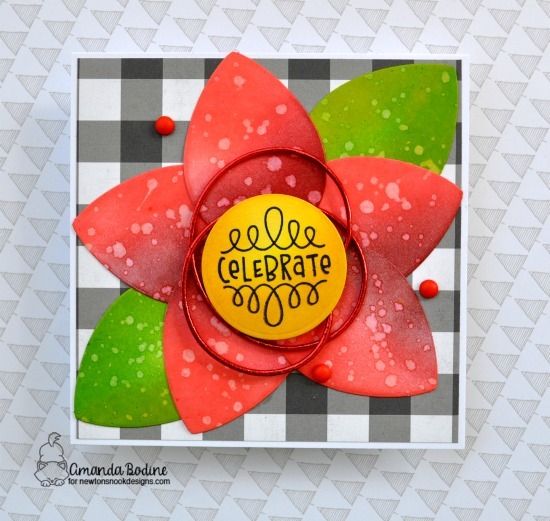 I stamped the sentiment from the Uplifting Wishes set right in the middle and glued some red cord under the circle center that I foam popped. Just kind of a silly little project to use up some scraps, but I quite like how it turned out. What do you think? Hello everyone and welcome to the NND March Release Day 1. Today and all week we've got some amazing birthday themed products to show you during this March Release. All products will be in store on Friday March 16th, so click HERE to shop! I made 2 cards using images from the Holding Happiness stamp/die set. These images are so sweet, I love the striped and polka dotted dresses! 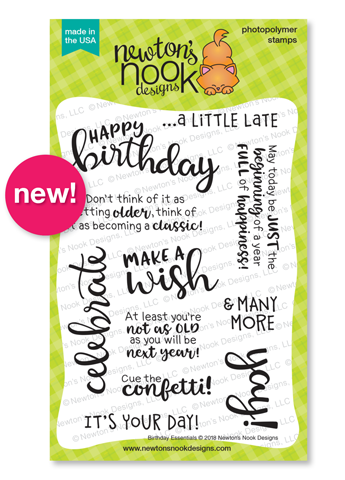 The sentiments are perfect for birthdays and MORE! I've also die cut and heat embossed the sentiments on one of the banners from the Flags and Frames Die Set. 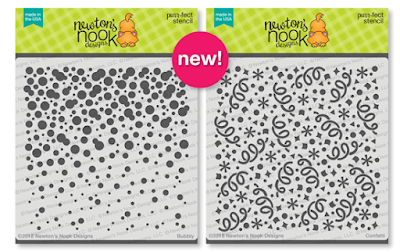 I also used the brand new, super cute Bubbly Stencil on my background. I hope you've enjoyed my projects and make sure to follow the list below and comment at all the blogs to win! 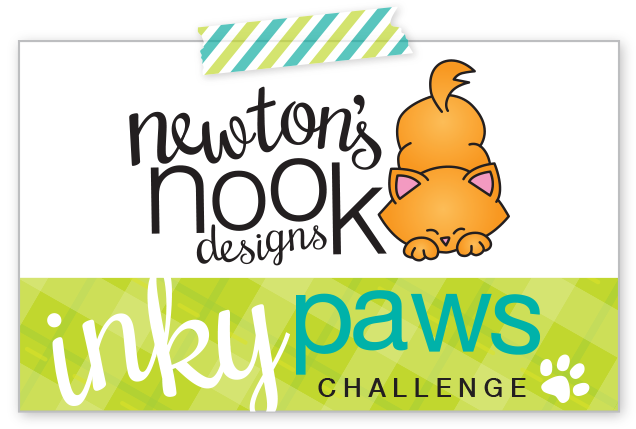 Newton's Nook Designs and Therm O Web Inspiration Week/Collaboration! Hello everyone, I'm so excited to show you this shaker card I made using Newton's Nook Lovely Blooms and Therm-o-Web Deco Foil Clear Designer Toner Sheets. I chose the Spring Green Deco Foil and the Groovy Clear Toner Sheet to make my window. 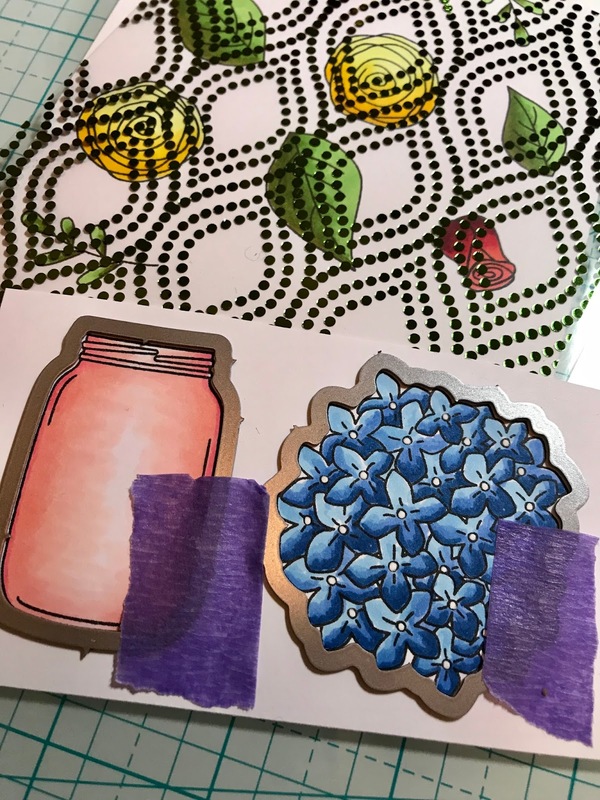 Then I colored all my NND images and secured the dies over the images using this FABULOUS Purple Tape. 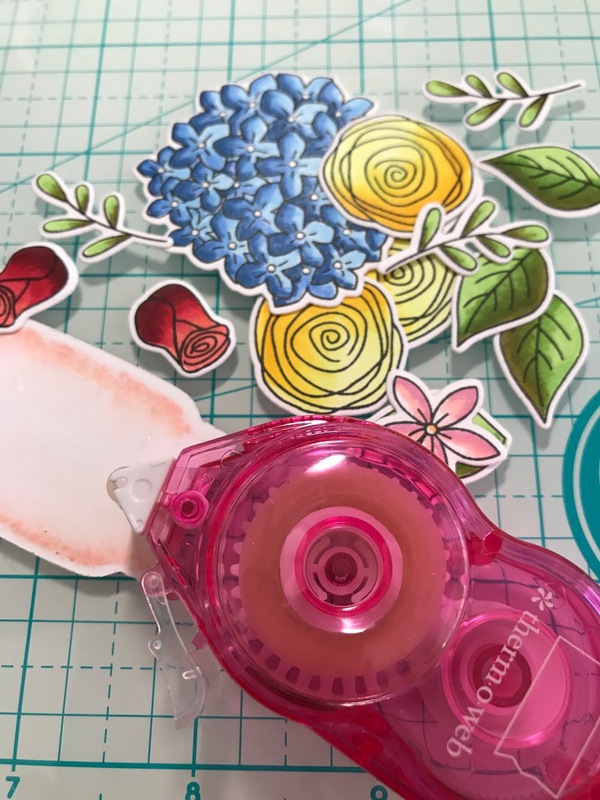 This is such a great product, it kept my colored images perfectly in place and was easy to remove after die cutting! After all my elements were completed, I die cut my frame and then also die cut 2 layers of Deco Foil Foam Adhesive. I added sequins from Kat Scrappiness Margarita Sequin Mix and Rainbow Connection Mix combined. I then glued down my frame by peeling off the backing to expose the sticky foam. I used the Sticky Tape Mini Runner to assemble my bouquet. It was really easy to use and held all my pieces in place perfectly. So here you can see my finished project from the side which really shows off the gorgeousness of the foiling!! Don't you just love it? btw, the little sentiment I added to the jar came from the set, Beautiful Wings. 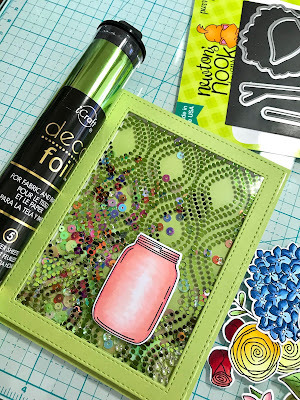 I am in love with foiling and cannot wait to make another project using Newton's Nook Designs and Therm-o-Web products!! Also, there are more amazing projects today over on the Therm O Web blog so pop over there for more inspiration! 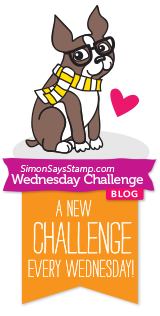 Here's how to win: Leave comments on the NND & Design Team blog posts using therm-o-web products all week (March 5-9) to enter. 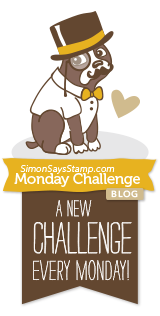 One winner will be randomly chosen from blog posts throughout the week so the more posts you leave comments on the better your chances are of winning! You have until Friday March 9th at midnight CST to comment. The winner will be announced on the NND blog post on Monday, March 12th.